and insights you need in one place, so you can act quickly and confidently. any time, wherever you are. and fundamentals in one place. your decisions and share your ideas. In this business you often need to make quick trade decisions -- that's where a customized view of the markets can help. Launchpad delivers all the rich content of the Bloomberg Professional service in a customizable and persistent desktop format, so you see the real-time information that's relevant to you and your strategies. The result? You can make quicker, smarter investment decisions. Choose from essential market data and insightful Bloomberg analytics to create your own customized pages. You can incorporate pricing monitors, charts, news, and analysis screens into each page to create views that cater to your workflow, displayed anywhere on the desktop. And you can get expert help in configuring the system to your needs, at no extra charge. Charting & Technical Analysis How you see your information can affect the decisions you make and the results you get. 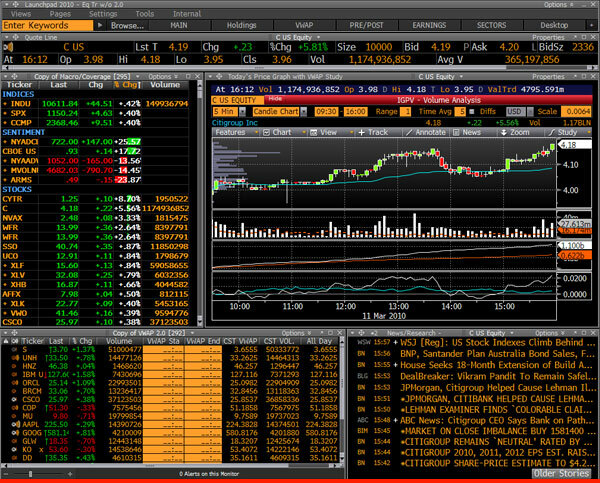 Bloomberg's customizable charting platform delivers exactly the view you need. You can create custom charts for single or multiple securities, view spreads or ratios, and perform historical research on your trading ideas. You can add events to your charts, including earnings releases and economic indicators, and enhance them with extensive technical analysis using standard, proprietary, third party and custom indicators. It's a platform that delivers, visibly.